The White House gave us a look today at a picture of the President during his down time. We hear he's pretty proud of this picture. It shows him playing basketball recently and blocking a shot by his aide, Reggie Love, who is younger, taller, and by the way, a former ball player at Duke. Now at the President's request, Love autographed it, writing, quote: “Nice block.” It now hangs in the West Wing so the President can savor the moment every time he passes by. 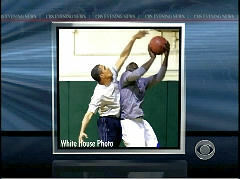 This wasn't the first time the CBS Evening News has oozed over Obama's basketball prowess. The NewsBusters item, “Day 1 of Obama's Magical Media Tour: All Air from Outside the Paint!” recounted how in 2008 CBS (along with ABC and CNN) were awed by video of Obama making a basketball shot at a gym with troops in Kuwait. Now, before Afghanistan Senator Obama stopped off in Kuwait to talk to the troops there. You remember all that grief Obama got for being a terrible bowler? Well, at a local gym someone handed him a basketball and he promptly sank a shot from way outside the paint. He made it look easy. You just have to pick the game.